2. Department of Surgery, Massachusetts General Hospital, Harvard Medical School, Boston, Massachusetts, USA. # These authors equally contributed to this work. Liver regeneration is usually attributed to mature hepatocytes, which possess a remarkable potential to proliferate under mild to moderate injury. However, when the liver is severely damaged or hepatocyte proliferation is greatly inhibited, liver stem/progenitor cells (LSPCs) will contribute to the liver regeneration process. LSPCs in the developing liver have been extensively characterized, however, their contributing role to liver regeneration has not been completely understood. In addition to the restoration of the liver parenchymal tissue by hepatocytes or/and LSPCs, or in some cases bone marrow (BM) derived cells, such as hematopoietic stem cells (HSCs) and mesenchymal stem cells (MSCs), the wound healing after injury in terms of angiopoiesis by liver sinusoidal endothelial cells (LSECs) or/and sinusoidal endothelial progenitor cells (SEPCs) is another important aspect taking place during regeneration. 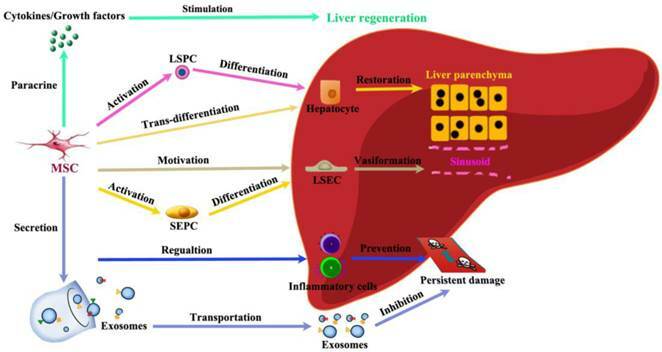 To conclude, liver regeneration can be mainly divided into three distinct restoring levels according to the cause and severity of injury: hepatocyte dominant regeneration, LSPCs mediated regeneration, extrahepatic stem cells participative regeneration. In this review, we focus on the recent findings of liver regeneration, especially on those related to stem/progenitor cells (SPCs)-mediated regeneration and their potential clinical applications and challenges. The liver has an enormous capacity to regenerate through different cellular responses depending on the nature and severity of the injury . The whole process of liver repair can be integrated into two aspects including regeneration and wound healing . In other words, in the context of liver injury, successful repair consists of both efficient parenchymal restoration and appropriate angiogenesis which are sufficient to promote liver regeneration in most cases . Both aspects are modulated by a dynamic interplay between parenchymal and non-parenchymal cells, including hepatocytes , hepatic stellate cells [5, 6], inflammatory cells , cholangiocytes , and liver sinusoidal endothelial cells (LSECs) [9, 10]. Therefore, defining the multi-cellular crosstalk that balances regeneration and dysfunctional healing holds promise to design new treatments for liver diseases. Liver regeneration is a relatively complex process and requires the coordinated contribution of different cell types . Generally speaking, due to different liver injuries, liver regeneration can be mainly divided into three distinct restoring levels . Under normal conditions, or after moderate loss of parenchyma by surgical resection, liver mass is maintained by division of hepatocytes [12, 13]. In addition to mature intrahepatic cells, resident and migrating stem/progenitor cells (SPCs) also actively participate in liver regeneration. For example, activation of liver stem/progenitor cells (LSPCs) is widely identified in both acute and chronic injuries [14, 15]. When hepatocyte proliferation is inhibited or overwhelmed, liver injury leads to the activation of LSPCs to replace the injured hepatic parenchyma [14, 15]. Hepatic oval cells (HOCs) and small hepatocyte-like progenitor cells (SHPCs) are two of the LSPC populations that have the capacity to differentiate into both hepatocyte and cholangiocytes . HOCs or SHPCs rapidly proliferateand differentiate into hepatocytes and cholangiocytes to compensate for the cellular loss and maintain liver homeostasis. In addition to intrahepatic SPCs, bone marrow (BM) derived SPCs can also contribute to liver regeneration by the fusion of mesenchymal stem cells (MSCs) with damaged hepatocytes, or differentiation into hepatocyte-like cells . In this review, we aimed to briefly introduce the proved mechanism involving in liver regeneration, especially the contributing responses of SPCs. The localization and cell surface markers for liver stem/progenitor cells (LSPCs). (A) So far, the origin of LSPCs is still not clear. Nevertheless, there is a widely accepted theory that LSPCs are derived from the canal of Hering, where the putative “resident” stem cells aggregate as the exact cell of origin. In addition, upon certain types of injury condition, LSPCs may expand and scatter in the liver parenchyma. (B) The representative intracellular and surface markers among species are shown. For human beings, rats and mice, LSPCs share some markers, however, there are differently expressed cell markers among different species. The most compelling markers potentially useful for isolation of LSPCs in different species, are shown. LSPCs are very different from tissue-resident stem cells in other epithelial tissue such as intestine and skin . In the latter tissues, SPCs are required throughout life to replenish cells lost daily, and without continued replication of the tissue-resident stem cells, the epithelia of intestine and skin fail rapidly. In contrast, LSPCs are “facultative,” meaning  (1) they are not needed to fill up liver tissue under normal, healthy conditions and (2) many markers of LSPCs are only expressed in the liver after injury when SPCs are activated. In severely damaged livers when there is a massive loss and/or an inhibited proliferative capacity of hepatocytes, activation of resident LSPCs occurs to contribute to regeneration . When activated, LSPCs migrate into the hepatic lobules and differentiate into hepatocytes or cholangiocytes to support or take over the role of regeneration [14, 15]. LSPCs reside in the terminal branches of the intrahepatic biliary tree (Canal of Hering) in normal liver (Figure 1A) . Recently, using Wnt-responsive gene Axin2 in mice, Wang et al. identify a population of LSPC-like cells adjacent to the central vein in the liver lobule . During liver injury and repair process, some LSPCs also appear scattered in the parenchyma. However, the lack of highly specific markers has hampered efforts to better understand the origin and physiology of LSPCs . Here we only briefly describe the potential markers used to detect or isolate LSPCs (Figure 1B), which is systematically described in our previous review . For sorting LSPCs, the following markers have been demonstrated effective, c-Kit-/low , c-Kit-c-Met+CD49f+/low , CD13+ , CD13+c-Kit-CD49f-/lowCD133+ , or CD24+CK19+  in combination with the non-hematopoietic marker CD45-TER119-. This CD24+ CK19+CD45-Ter119- cell population represented 0.04% of liver cells and expressed several markers of LSPCs, such as CD133, Dlk, and Sca-1 high, but c-Kit, Thymus cell antigen-1 (Thy-1), and CD34 low. In liver damage condition, single cell marker is also widely used to screen LSPCs. For example, it is demonstrated that Lgr5 ((leucine-rich-repeat-containing G-protein-coupled receptor 5)+ small cells near bile ducts actively take part in the liver regeneration after damage by generating significant numbers of hepatocytes and biliary duct cells . Two modes of LSPCs mediated liver regeneration in rats and mice. Both in rats and in mice, partial hepatectomy (PHx) is applied to cause liver injury for the remaining tissue to enlarge and recover the original mass. This type of regeneration is mainly accomplished by mature hepatocytes in the remaining tissue. When PHx combines with the impaired proliferative capacity of hepatocytes by treatment with 2-acetylaminofluorene (2-AAF)-containing diet in rats and 3,5-diethoxycarbonyl-1,4-dihidro-collidine (DDC)-containing diet or a choline-deficient, ethionine-supplemented (CDE) diet in mice, immature LSPCs are activated and contribute to the regeneration process by differentiating to hepatocytes and cholangiocytes. Partial hepatectomy (PHx) is considered as a classical model for studying liver regeneration in mammals . In those damaged livers where hepatocyte proliferation is compromised, LSPCs are activated and differentiate into hepatocytes and cholangiocytes, leading to functional recovery of the organ. In humans, a minimum of 50% hepatocyte loss is required for significant activation of the LSPC compartment , and there is an inverse correlation between the number of LSPCs and the number of proliferating hepatocytes with Ki67 expression . This suggests that a combination of hepatocyte loss and impaired hepatocyte proliferation is required to activate LSPC. For stimulating LSPCs to participate in liver regeneration in rodents, a number of models have been applied (Figure 2). The most popular model to induce LSPCs is the combination of PHx with chemical inhibition of hepatocyte proliferation using 2-acetylaminofluorene (2-AAF) or retrorsine in rats, where hepatocyte proliferation is blocked by 2-AAF before and after PHx while inducing a robust LSPCs response [31, 32]. However, in mice this system is not applicable because it fails to produce convincing activation of LSPCs, instead, several other dietary or toxin models of LSPC activation have been described. In short, the administration of a 3,5-diethoxycarbonyl-1,4-dihidro-collidine (DDC)-containing diet [33, 34] or a choline-deficient, ethionine-supplemented (CDE) diet [34, 35] is the most extensively used model for activating LSPCs. The LSPC response can be divided into four phases: activation, proliferation, migration and differentiation (Figure 3), the final step leading to either hepatocytes or cholangiocytes. The LSPC niche comprises the parenchymal and non-parenchymal resident liver cells, recruited inflammatory cells, extracellular matrix (ECM) as well as the variety of growth-regulating factors [14, 33, 36-38], which together control the LSPC response to liver regeneration. The LSPC niche is composed of a large variety of cell types (Figure 3A) such as hepatic stellate cells, LSECs, hepatocytes, cholangiocytes, Kupffer cells, pit cells and inflammatory cells . All these cell types, numerous hormones and growth factors could interact and cross-talk with LSPCs influencing their proliferative and differentiative processes (Figure 3B). For instance, macrophages and T-cells have been shown to interact with LSPCs to regulate proliferation, differentiation, and migration of LSPCs [40-42], while hepatic stellate cells or myofibroblasts have also been observed in close proximity of LSPCs both in mouse  and in patients with liver diseases . The hepatic stellate cells are major resident non-parenchymal liver cells . During the early period of liver regeneration (2-6 days after injury), it was found that hepatic stellate cells secreted high levels of hepatocyte growth factor (HGF) and stimulated LSPC proliferation via extracellular signal-regulated kinase and p38 pathway, whereas in the terminal phase of liver regeneration (12 and 15 days group) hepatic stellate cells generated high levels of transforming growth factor (TGF)-β1, which in turn suppressed LSPCs' DNA synthesis. These results indicate that hepatic stellate cells have the dual role of promoting and inhibiting LSPCs proliferation during the liver regeneration process , act as a positive regulator at the early phase and a negative regulator at the terminal phase of the LSPC-mediated liver regeneration. The shift between these two distinct effects depends on the balance between HGF and TGF-β1 secreted by hepatic stellate cells. In addition, it has been demonstrated that Thy-1+ mesenchymal cells are also part of the LSPCs niche [47, 48]. In all models of LSPC-mediated liver regeneration they proliferate quickly and expand significantly and disappear from the liver when the LSPC response subsides. Activated Thy-1+ cells do not express LSPC genes but they express other genes (CD105, CD73, CD29) known to be expressed in MSCs, genes considered specific for activated hepatic stellate cells (desmin, collagen I-α2, matrix metalloproteinases (MMP)2, MMP14) and myofibroblasts [alpha smooth muscle actin (alpha-SMA), fibulin-2], as well as growth factors and cytokines (HGF, tumor necrosis factor (TNF)-like weak inducer of apoptosis (TWEAK), interleukin (IL)-1β, IL-6, IL-15) that can affect LSPC growth [47, 48]. The impact of LSPC-niche on LSPCs mediated liver regeneration. The LSPCs mediated liver regeneration involves four consecutive processes including activation, proliferation, migration and differentiation into hepatocytes and cholangiocytes. Thy-1 positive cells play a critical role in each step of LSPCs reaction by producing cytokines or intercellular crosstalk. Among those cells affecting LSCPs response, LSECs and SEPCs are very important, because they not only take responsibility for vasiformation, but also contribute to major HGF production. In addition, hepatic stellate cells and macrophages can send signals directly to stimulate LSPCs response to liver injury. In addition to the cross talking among cells in the LSPC niche, ECM can also be a factor that regulates LSPC activity and function [38, 49-51]. Recent studies have shown a requirement for matrix remodeling by MMPs for the proliferation of LSPCs . What's more, in ECM, a range of growth factors [33, 34] including HGF, epidermal growth factor (EGF), TGF-α and stem cell factor (SCF) have been shown to be important in stimulating LSPCs growth, whereas TWEAK/Fibronectin (FN) 14 and stromal-derived factor 1/CXC receptor 4 (SDF-1/CXCR4) have been shown to be important for their activation and migration respectively. Multiple cytokines are involved in the activation and proliferation of LSPCs (Figure 3B). These cytokines include TNF , lymphotoxin alpha , lymphotoxin beta , interferon gamma (IFN-γ) , IL-22 , and IL-6 . Two growth factors, fibroblast growth factor (FGF)7  and granulocyte-colony stimulating factor (G-CSF) , have been proposed to act as mitogens for LSPCs. Among these cytokines and growth factors, HGF is considered to be the important. HGF/c-Met supports a pleiotrophic signal transduction pathway that controls LSPCs homeostasis . Loss of c-Met receptor decreases the sphere-forming capacity of LSPCs in vitro and reduces LSPC pool, impaires migration, and decreases hepatocytic differentiation in vivo. These results establish a direct contribution of c-Met in the regulation of LSPC response and support a unique role for HGF/c-Met as an essential growth-factor-signaling pathway for regeneration of diseased liver. Another key regulatory mechanism for LSPC response is EGF/EGF receptor (EGFR). Both HGF/c-Met and EGF/EGFR collaborate to increase the self-renewal capacity of LSPCs through activation of the extracellular signal-regulated kinase pathway (ERK) . The c-Met is a strong inducer of hepatocyte differentiation by activating protein kinase B (PKB or AKT) and signal transducer and activator of transcription (STAT3). Conversely, EGFR selectively induced Notch1 to promote cholangiocyte specification and branching morphogenesis while concomitantly suppressing hepatocyte commitment. The inflammatory infiltrate may also provide paracrine signals from growth and chemotactic factors to initiate the regenerative response. Potentially important elements of the inflammatory response that may stimulate LSPCs include IL-6 family [leukaemia inhibitory factor (LIF) and oncostatin M (OSM)], lymphotoxin-beta, IFN-γ and TNF superfamily including TNF-alpha and TWEAK . One of the best-established cytokines among these is TWEAK, which is produced by macrophages and has great paracrine effect on LSPCs activation and expansion [59-62]. LSPCs mediated liver regeneration is followed by a series of events involving multiple signaling pathways controlled by the previously mentioned growth factors and their receptors. The involvement of Wnt, Notch and Hedgehog (Hh) signalling pathways in LSPCs activation in humans has also been reported recently [63, 64]. Activation of Notch and Wnt pathways by the surrounding niche has been shown to play a critical role in the determination of LSPCs to hepatocytic and cholangiocytic fates [23, 40, 65]. There are results implying that the Wnt pathway is involved in directing LSPCs toward the hepatocytic fate, while the Notch pathway promotes differentiation of LSPCs toward the biliary lineage [23, 40, 66]. The Notch ligand Jagged1, generated by Thy1+ fibroblasts, acts on the Notch receptor expressed on LSPCs to activate the downstream signaling pathway, leading to differentiation of LPCs to cholangiocytes . In contrast, the canonical Wnt molecule acts on LSPCs to induce beta-catenin signaling and expression of a Notch signal inhibitor, Numb. This eventually results in suppression of the default Notch signaling for biliary differentiation in LSPCs and, in turn, stimulates their differentiation to hepatocytes . In addition, as the Wnt target gene, Lgr5 marks actively dividing stem cells in liver regeneration. In fact, Lgr5+ small cells can give birth to both hepatocytes and biliary duct cells during the repair phase . Thus, the balance between two distinct niche structures with different signals is critical to shape the outcome of activated LSPCs to induce proper regenerative response according to the nature of liver injury. As a upstream functional important effector of Notch-signaling pathway, Hippo pathway signaling in vivo is sufficient to differentiate LSPCs into hepatocytes . 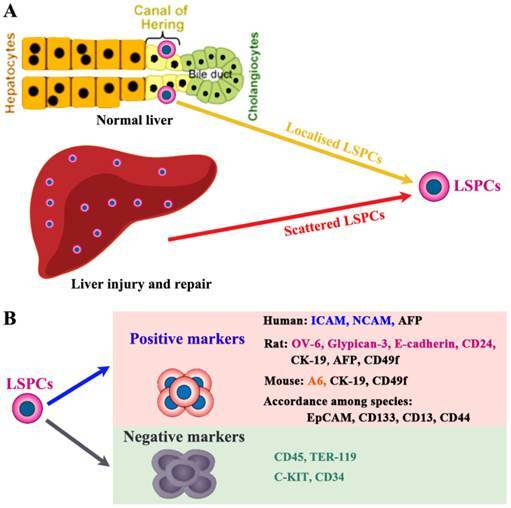 The pertinent activation of LSPCs is safe and necessary to help restoring severely damaged liver, however, whether LSPCs could be over-activated and impair normal liver regeneration remains unclear. Recently, it has been demonstrated that repeated LSPC reactions are not necessarily carcinogenic . That is to say, the expansion of LSPC compartment conceptually can be used to facilitate liver regeneration without an increased risk of tumorigenesis. The utilization of LSPCs for cell therapy is an attractive alternative to organ transplantation for the treatment of liver disease. There are several advantages to using LSPCs instead of primary hepatocytes or whole organ transplantation. First, a single LSPC can be expanded in culture without losing its bidirectional differentiation potential . Second, the fact that LSPCs are found in the liver with various types of disorders suggests that LSPCs can be isolated from diseased livers that cannot be used for organ transplantation . Third, it might be possible to isolate LSPCs from a patient who has liver disease, expand them in culture, and transplant back to the patient. This autologous transplant protocol would obviate the need for immunosuppression after transplantation. Finally, LSPCs are smaller than hepatocytes, and it has been suggested that smaller cells might have less of a tendency to cause portal hypertension following injection into the portal vein. In short, isolation and transplantation of LSPCs could represent a new approach for therapy of end-stage chronic liver diseases, as they offer many advantages to transplantation of mature hepatocytes. Liver regeneration requires spatiotemporally precisely coordinated proliferation of the two major liver cell populations, hepatocytes and LSECs, to reconstitute liver structure and function . LSECs control liver regeneration in a much more dynamic manner through stimulatory and inhibitory effects. LSECs support hepatocytes in resting liver and proliferate during liver regeneration to revascularize regenerated liver parenchyma . In the early phases of physiological liver regeneration, inhibitor of DNA-binding protein (Id)1 mediates inductive angiogenesis in LSECs through producing angiocrine factors Wnt2 and HGF, which provokes hepatic proliferation . Notably, there is a counterbalance between activation of CXCR7-Id1 pathway in LSECs and CXCR4 upregulation after chronic injury. When CXCR7-Id1 pathway overwhelms CXCR4 pathway, it leads to normal liver regeneration. In contrast, after iterative stimuli, predominance of CXCR4 upregulation over CXCR7-Id1 activation causes fibrosis . Collectively, these data shed fundamental insights into the role of the endothelium as a gatekeeper and regulator of liver regeneration . Recent studies indicate that not LSECs but SEPCs express more HGF and played more important roles in liver regeneration [10, 72]. Two populations of SEPCs have been identified: BM SEPCs and resident or intrahepatic SEPCs (Figure 4) [9, 10, 73]. Within the liver, a putative resident SEPC population has been identified based on its characteristics as a label-retaining cell. Although the logical function for the resident SEPCs would be to give rise to LSECs in normal turnover, such functionality has yet to be demonstrated. Both resident and BM SEPCs are positive for the progenitor cell marker CD133 and, like the LSECs, they express the endothelial cell marker CD31 and the hematopoietic cell marker CD45 , also positive for vascular endothelial growth factor (VEGF) receptor (VEGFR)1 and VEGFR2. 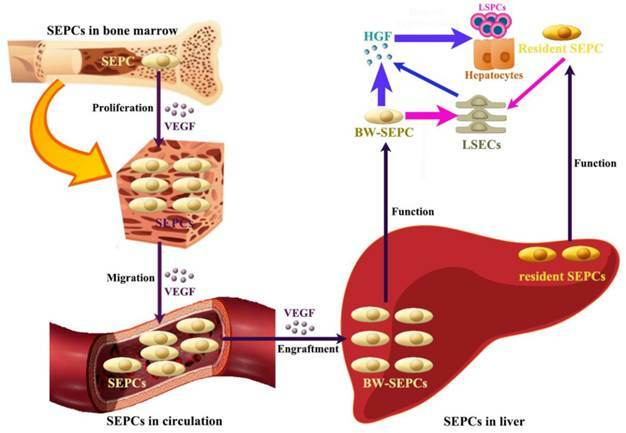 After both toxic injury and PHx, hepatic VEGF has been shown to regulate each step of BM SEPC recruitment to the liver: proliferation of BM SEPCs, mobilization of BM SEPCs to the circulation, engraftment of BM SEPCs in the liver, and differentiation of BM SEPCs to fenestrated LSECs lining the sinusoids [9, 10, 73]. After PHx or toxic injury, proliferation of BM SEPCs increases more than two-fold and mobilization of BM SEPCs to the circulation increases two- to four-folds . Thus, the BM SEPC response is a repair response to disparate forms of liver injury. It is believed that BM SEPCs that have been recruited to the liver, rather than mature LSECs, are the major drivers of liver regeneration (Figure 4) . Compared to the resident SEPCs mainly contributing to normal LSEC turnover in the liver , BM SEPCs proliferation and mobilization to the circulation doubled and differentiated into fenestrated LSECs comprising one-quarter of the total LSECs after liver injury. What's more, BM SEPCs that engraft in the liver proliferate much more than resident SEPCs and are the major source of increased HGF in the LSEC fraction . It seems that when present in their niche, resident SEPCs play a lesser role in LSEC repopulation after liver injury than BM SEPCs (Figure 4). However, when resident SEPCs are isolated from the liver and infused after PHx, there is marked expansion of the SEPCs with persistent engraftment as LSECs and SEPCs. In addition, whether the mature LSEC also proliferates or whether all of the proliferation is attributable to resident and BM SEPCs remains to be determined. To summarize, after liver injury, BM SEPCs mainly repopulate the sinusoid as LSECs providing HGF to promote hepatocyte restoration . The contributing roles of SEPCs during liver regeneration. There are two types of SEPCs including bone marrow derived SEPCs (BM SEPCs) and resident SEPCs existing in the liver. Under VEGF stimulation, BM SEPCs obtain increased proliferation, mobilize into circulation, and transplant in remaining liver tissue to help restoration. The recruitment of SEPCs from bone marrow are more likely to replenish LSECs for vasiformation than resident SEPCs. What's more, BM SEPCs not resident SEPCs mainly secreting cells of HGF. The HGF released by SEPCs and LSECs is the key factor for LSPCs or hepatocytes responses. The contribution to liver regeneration from different kinds of extrahepatic stem cells migrating to the injured liver such as HSCs and MSCs has been previously demonstrated . BM HSCs are mobilized after liver resection, limit IL-1β signaling mediated inflammation, and boost regeneration in a CD39-dependent manner . Due to their great contribution in liver repair, currently available HSCs mobilizing agents (G-CSF, Plerixa or G-CSF+Plerixa), were comparatively tested for healing potential in liver fibrosis . In comparison to BM HSCs, BM MSCs exhibit a greater homing capability for the injured liver and modulate fibrosis and inflammation more effectively . However, synergistic effects of MSCs and HSCs were not observed in liver injury. Among immune regulating cells, both MSC and T regulatory (Treg) cells have been considered as possible therapeutic agents due to their ability to suppress inflammation, which is seen in many forms of chronic liver injury . MSCs participate in liver regeneration in several different aspects (Figure 5). (1) MSCs help restore injured liver mass through paracrine factors: CXCR4 overexpression enhanced the mobilization and engraftment of MSCs into small-for-size liver grafts, in which these cells promoted the early regeneration of the remnant liver perhaps by a paracrine mechanism . (2) MSCs release exosomes to initiate protective responses: Recently, MSC-conditioned medium (MSC-CM) containing exosomes has been shown to have protective effects against various liver injury models. MSC-derived exosomes can elicit hepatoprotective effects against injury, mainly through activation of proliferative and regenerative responses . (3) MSCs could trans-differentiate into hepatocytes under certain inductive conditions: It has been hypothesized that under the influence of liver-regenerating cues, BM-MSCs can directly differentiate into hepatocytes . (4) MSCs have the power to stimulate VEGF generation for vasiformation: BM-MSCs have been reported to facilitate liver regeneration after toxic injuries and massive hepatectomy, possibly by upregulating the level of VEGF . (5) MSCs regulate inflammatory reaction after liver injury: MSCs promote liver repair by systemically concomitant mechanisms involving hypoxia-inducible factor-1alpha (HIF-1α) and autophagy . Schematic depicting the contributions of MSCs to liver regeneration. Liver injury induces proliferation and migration of MSCs. The recruitment of MSCs in the liver in turn actively participate in liver regeneration in several different ways: paracrine effective factors, release exosomes to initiate protective responses, trans-differentiate into hepatocytes, stimulate vasiformation, regulate inflammatory reaction. Although the contributing roles of different types of SPCs have been greatly elucidated in liver regeneration and summarized in this review, the underlying detailed mechanism is still far from clear. There are several fundamental and critical issues concerning SPCs involved in liver regeneration that need to be addressed. First of all, the identification and isolation of SPCs remains a challenge. In spite of some potential markers being used to detect or isolate SPCs in the liver, there are some variations among species, especially for LSPCs. In addition, the existing markers are not specific enough for investigating subsets of SPCs, such as SEPCs. Moreover, the localization and origination of most SPCs is waiting to be thoroughly investigated. Secondly, the complete function of SPCs involved in stem cell mediated liver regeneration is pending to be explained: it is not clear if they restore damaged liver mass by differentiation into parenchymal or non-parenchymal liver cells, or by promoting regeneration and reducing damage via secreting cytokines/growth factors. Thirdly, the activating order of both intrahepatic stem cells and extrahepatic stem cells needs to be clarified, thus we can make these stem cells coordinate well and orchestrate liver regeneration. Last but not the least, it is imperative to determine the cross-talk among all these SPCs including LSPCs, SEPCs, MSCs and HSCs. When the above mentioned questions are totally answered, a proper liver regeneration could be achieved, without having the risk of over or deficient restoration that could lead to fibrosis or liver failure respectively. Two broad strategies have been employed to enhance liver regeneration: (i) administration of stimulating factors such as G-CSF to enhance endogenous SPCs regeneration and (ii) infusions of exogenous SPCs to drive regeneration. In light of the current results, improvement of these therapies may require the co-infusion of hepatocytes/LSPCs with SECs/SEPCs. Moreover, the administration of autologous or allogeneic HSCs or/and MSCs can augment liver repair by either stimulating endogenous repair mechanisms or by suppressing ongoing damage. In addition, combining liver cells with a mimetic scaffold is also very promising . As an attractive technique for scaffold preparation, decellularization can guarantee the resulting material possible to retain the liver architecture, native vessel network and specific ECM . Because the SPCs-based therapies are critically dependent on the appropriate lineage differentiation of the SPCs with a high efficiency and on a considerable scale, decellularized liver bio-scaffold may provide a three-dimensional extracellular matrix for the lineage restriction of SPCs maturation. Thus, functional SPCs composite decellularized scaffolds is promising to reconstruct liver tissue. Since promotion of liver regeneration can benefit from the in vitro expansion of intrahepatic and extrahepatic SPCs, specific and safe genetic modifications aiming at these SPCs may become feasible and helpful. Once these SPCs are well modified, they can more actively involve in liver regeneration. Shortly, as the roles of cell therapies in promoting liver regeneration are gradually better understood, these therapeutic approaches will be refined and new pharmacological agents for liver repair will be developed. Nevertheless, several confronted challenges of cell therapy should be taken into consideration or discovered in the future, such as how to design a precise scheme of cell therapy based the conditions of patients, how to evaluate the effecacy of cell therapy, how to avoid possible side effects of cell therapy, and so on. In brief, our review may serve as a primary guidence for the development of regenerative strategies using SPCs during liver regeneration. Once we illuminate the mechanisms of SPCs mediated liver regeneration, it has very promising cilinical application in treating kinds of human liver diseases. First, for cell therapy SPCs could serve as an alternative treatment or brigde strategy for liver transplantation, especially when the donor is lack. Second, activation of endogenous SPCs is not only necessary to reserve sufficient liver function before extreme volume liver resection, but also efficient to restore damaged liver function after severe liver trama. Third, it is possible to modify liver cells under metabolic liver diseases. In detail, we can isolate SPCs from a patient who has liver disease, correct them using gene modificatin, expand them in culture, and transplant them back to the patient. Last, with the help of tissue engineering techniques, it is relatively far but very promising to rebuild a whole liver with normal function when combination of SPCs with decellularized liver scaffold. In the future, if the normally functional liver could be produced, we would have more chances to treat end-stage liver diseases. LSPCs, liver stem/progenitor cells; LSECs, liver sinusoidal endothelial cells; SEPCs, sinusoidal endothelial progenitor cells; MSCs, mesenchymal stem cells; BM, bone marrow; HSCs, hematopoietic stem cells; SPCs, stem/progenitor cells; PHx, partial hepatectomy; ECM, extracellular matrix; BM-MSCs, bone marrow MSCs; MMP, matrix metalloproteinases; HGF, hepatocyte growth factor; EGF, epidermal growth factor; TGF, transforming growth factor. Sincere thanks go to Feng Wang (the Fourth Military Medical University, China) for renovating Figures. All authors have disclosed that they do not have any potential conflicts of interest. All authors have read the journal's policy on conflicts of interest. All authors have read the journal's authorship agreement.